Here’s a soup for those times when you want something light in calories but filling, nutritious and quick. You wouldn’t think that such a simple soup could taste so delicious and have so many healing benefits…..
What is miso? Miso is a a thick paste made from fermented soybeans and barley or rice malt. It is mostly used in Japanese cooking to make soups or sauces. What are the health benefits of miso? It is a complete protein with all essential amino acids, helps the intestines digest and assimilate foods, strengthens the immune system, and is naturally high in antioxidants that help fight harmful free radicals. 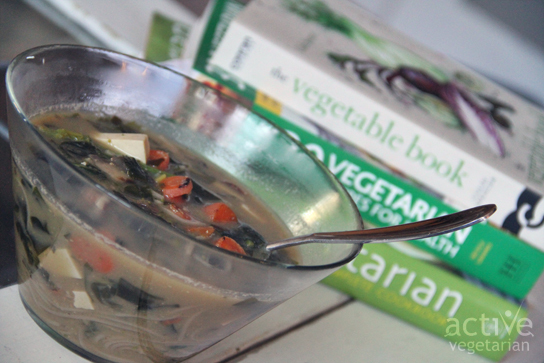 So, instead of a bowl of chicken noodle soup when you’re feeling a cold coming on, try a bowl of miso soup! Heat the sesame oil in a large, non-stick soup pot. Add the ginger,onion and garlic and cook for one minute. Add the water, seaweed, carrots, broccoli and mushrooms and bring to a simmer. Cover and simmer for 15 minutes, or until veggies are tender. Add the cubed tofu and cook for another 5 minutes. Place the miso in a bowl and add about 1/2 cup of the soup broth. Stir or whisk until there are no lumps. Add miso to the soup and heat through but do not boil. Taste and add more miso as needed. Refresh the noodles with cold water, add to the miso broth + vegetables. Add fresh spinach. Stir well to combine. Serve immediately topped with spring onion, sesame seeds+ a little chili. Actually top it with whatever you like. Enjoy this bowl of goodness. This looks GREAT!! 🙂 I can’t wait to make it! How many servings does the recipe yield?